Like most people I have spent the last several months listening to the presidential candidates debate (though primary season was much more exciting in Texas, where the red meat of the primaries frankly mattered more, assuming you were registered to vote in The Party primary). 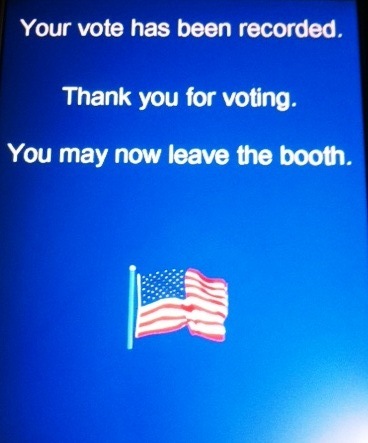 And today I went to my local precinct to vote with James – where there we no lines and no waiting. It seemed surprisingly anti-climactic, given all the hype. But what actual voting lacked in excitement, it made up for in seemingly never ending choices. 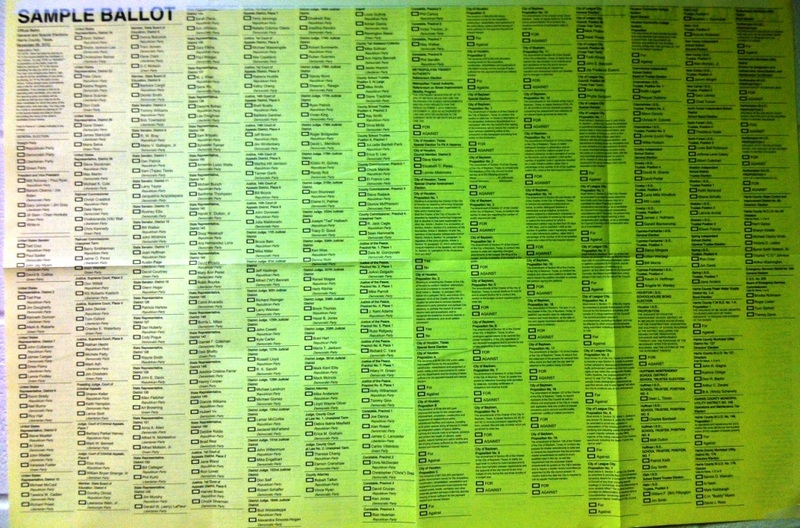 Here is the poster of our sample ballot. It is insane.Insane because I like to think of myself as an engaged and informed voter. But I don’t stand a chance against that ballot. In reading the paper and watching the news over the last several weeks and months I can honestly say I have heard of very few of the people running for any of these down ballot races. When doing some last minute research on my choices, I was reminded how difficult, actually how futile it can feel when trying to be an informed voter on a six page with three columns per page paper ballot (though the format is irrelevant). Assuming you could actually find data on all these races – what the office is, what is its role in my life; then who the candidates are and what is there position/stance on relevant issues – there is honestly no way you could even remember all of the names and offices you had studied. And of course there isn’t that type of information readily available to the voting public. I was also saddened to see that in many of these races apparently there aren’t even enough people that care to have each major party field a candidate. This state wide list of candidates makes me wonder is voting on all these offices really necessary? I’m not doubting the need for the office itself, just the cost and efficacy of voting on it. But let me leave you with a happier thought. I hope we can all be proud to be Americans and be grateful for our freedom to vote, and for the men and women who have given their time, talents, and lives to preserve, protect, and defend this right for all of us. I am. Happy Election Day everyone. Can only echo the frustration about the difficulty in obtaining ACTUAL information to be an educated voter!!! We teamed up to sift through all of the crap, and then had to take a “cheat sheet” into the booth because there were too many names to remember. I am very proud of our state’s voter turnout, though. I heard we typically lead the nation, and this year projections went as high as 85%. I hope we make that!